With all the existing frameworks and libraries, the web frontend development tech stack is extremely rich and multifaceted. For a business owner willing to take his business online, choosing suitable tools might be a tough call. Yet, it still remains a crucial aspect for the future success of a product. Choosing a tried and true tool, such as Angular, might seem like a good idea. But there are more options to consider if you are building a specific type of product. React, one of the fastest-growing and most popular frontend libraries, has been steadily gaining traction among developers, as well as business owners. Due to a number of its benefits, it might soon become the go-to web development tool. Why choose React? And, most importantly, when should you use it? Let’s take a closer look at the advantages of React and its use cases. A relatively young framework, ReactJS has taken the web development world by storm. Created initially as an internal tool by Facebook engineers, the framework soon went open source, which allowed it to further grow and become widely adopted among individual developers. 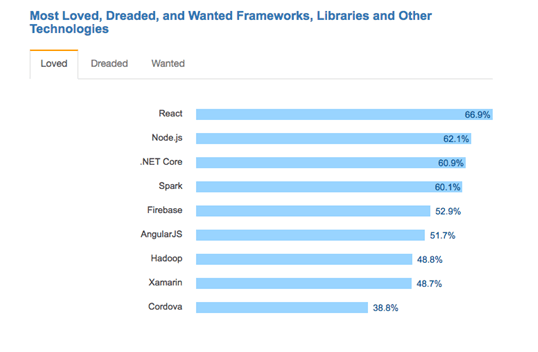 The latest Stack Overflow Developer Survey finds that React is the most loved among the frameworks, libraries and other technologies: 66.9% of developers gave their votes for it. At the same time, it is also the third most wanted technology, according to this survey. This clearly indicates the fact that the library is not only highly rated by the developer community, but also is in great demand among business owners. Despite its popularity, the Angular vs. React dilemma is completely unfounded. While Angular is a full-fledged MVC framework, React is a lightweight view library, which typically needs to be complemented with other tools (Flux or Redux) to get a complete architecture. Thus, comparing React and Angular is somewhat similar to comparing apples and oranges. In fact, both tools can be used interchangeably within one project (which, however, is not recommended, mostly to avoid violating coding standards and best practices). React allows you to write modular and clean code, breaking the project into separate components. This also allows for code reuse, which can really boost developer productivity. Unlike large monolithic projects, React code is easy to maintain and update due to its modular structure. React products are extremely flexible and can be scaled easily. This can significantly save time and money in the long run. Designed with performance in mind, the library’s core features, such as virtual DOM and server-side rendering, allow you to create large-scale apps which are really fast. Being an open source technology, React is free and open for all. Moreover, it has a rich ecosystem, including such must-have tools as Flux or Redux as well as Node.js on the backend or a large number of task-specific open source libraries, listed on npm. Being built initially at Facebook, the library is still supported and maintained by the company as well as by more than 1,000 independent contributors worldwide. Thanks to the vibrant community and solid corporate support, React is a reliable and up-to-date technology. React Native is a mobile development framework, based on React. Thus, it is easy for React JS developers to switch to React Native and create mobile apps with a native look and feel. Moreover, some parts of your React web app can be reused in a React Native mobile app (mostly business logic), which improves the development speed. Thanks to the above listed benefits, React has gained a huge adoption over the last several years. The list of websites using React is constantly growing. Right now, some major web products such as AirBnB, Coursera, Dropbox, Expedia, Facebook, HipChat, Instagram, Netflix, Reddit, Salesforce, Twitter, Uber, WhatsApp, WordPress, Yahoo, Zendesk and many others rely on React. On the other hand, using React on static websites and blogs could be unjustified. 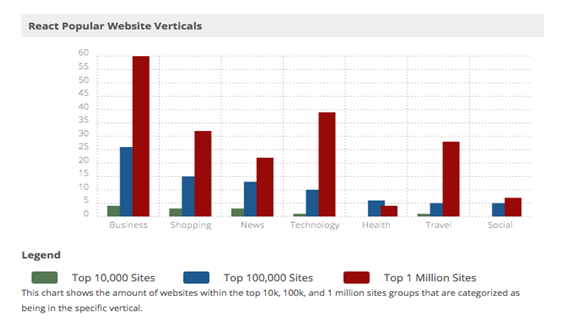 Thus, React finds its best application within certain verticals, including business, technology, travel, and shopping. All in all, in a modern fast-paced business environment having your product built with a future-ready and flexible tech stack could be a huge benefit. So if you are thinking about using React for your next project, get in touch with us now. We will offer a free technology choice consultation based on our 7+ years of experience in web development.